45/365(+1), a photo by Luca Rossini on Flickr. Since the beginning of the project my sight has changed. I don’t know how to explain it, but it’s like it was before set on Standard Definition while now feels more on High Definition. I see more clearly colors, lights and shapes. Things look more dramatic and beautiful. I’m experiencing some sort of enriched perception, which I think comes together with the constant alertness towards visualizing the daily shot. Whenever I’m on the move, I’m mentally wondering around, trying to spot new places which could deliver the kind of mood I’m currently looking for. That beautiful creepy mood of a dream. Today I found it where it was least expected. 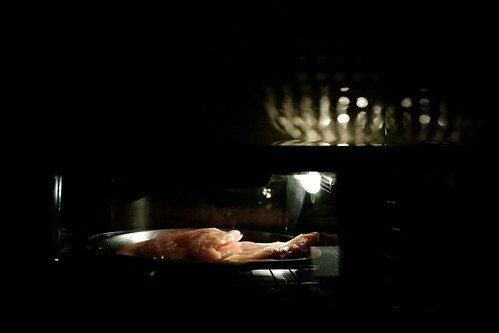 It was almost like I was on heavy drugs, some sort of hallucinogen moment happened all of a sudden, I was cooking dinner and the chicken breasts were defrosting in the oven, when I found them beautiful. And creepy. And that’s the mood I’m talking about. I switched off all lights, and there it was, two chicken breasts sensually languishing over each other in a warm privet while all around disco-like lights were feebly shining. OK, maybe that does not sound as such of an epiphany to you, but it’s the best I get at the moment. And I’m curious to see what the future holds. How deeply I can walk into the free-of-drugs hallucinogenic state, and what I will see from there. No blue or red pills, I’m not “the chosen” so probably I won’t see “the Matrix”. Like most things in life, enriched perception is also a matter of perseverance and daily training, the kind of perseverance and training this project is forcing me to have. thanks for the work you do on the blog. I love your comment on how this project has changed how you view things and I think this is exactly what I'm going to do. I just got into photography and what a perfect way to learn and stay motivated. Thanks.